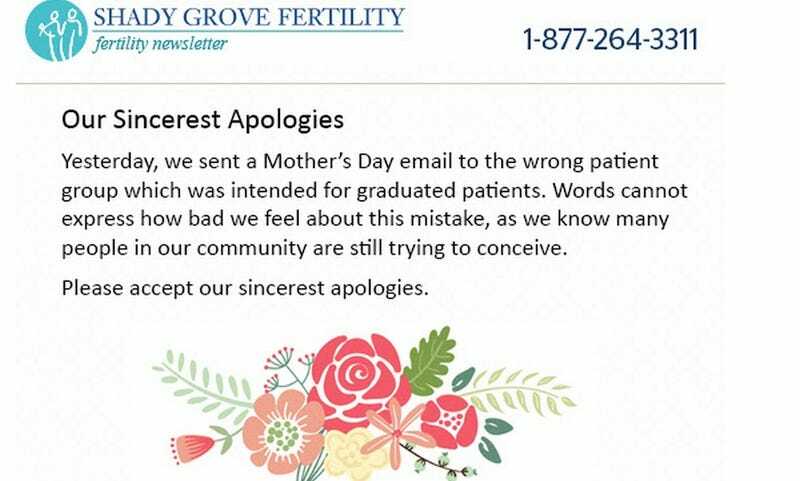 Shutterfly wasn't the only company to send out Mother's Day emails congratulating non-moms on being moms: Shady Grove Fertility did the same thing, except theirs went to a group of people specifically trying to get pregnant, not people who had already done so. I'm very upset to have received the Happy Mother's Day email yesterday. I wondered why that was sent to me from the fertility clinic in which I've paid over $23,000 to in order to have my baby. It was bad enough that it was Mother's Day & then I recently had a D&C for a miscarriage on 4-26. Talk about kicking you while you're down. We should just cancel Mother's Day.